LONDON, England (CNN) -- From January 28 to February 1 CNN is broadcasting live and reporting online from the World Economic Forum in Davos, Switzerland, as the world's leading power brokers and moneymakers gather to discuss the state of the world in 2009. The world financial meltdown, renewed conflict in the Middle East, U.S. President Barack Obama's new White House administration and environmental issues are likely to be some of the topics at the top of this year's agenda. CNN wants CNN.com users and CNN International viewers to get involved. You could have your questions asked on air by CNN Anchor Charles Hodson by e-mailing us at deardavos@cnn.com. As part of this year's "Dear Davos" coverage, CNN has also invited a selection of influential bloggers to submit their questions to be put to our guests during our daily coverage. Businesses still seem to be on the sidelines during the U.N. international climate negotiations. Lowering global carbon emissions relies on creating a new low carbon economy, so should businesses have a greater role in putting together a post-2012 climate change plan? If so, how could businesses best aid negotiations / If not, why not? When I was in China two months ago I noticed the extreme pollution, but I also noticed that they were copying western consumer habits (like buying American SUVs). How can we convince the rest of the world to fix their pollution problems when we can't even convince Americans to buy smaller electric cars? Should we be more concerned with the concept of what Margaret Thatcher used to call "sound money" than trying vainly to spend our way out of a recession? 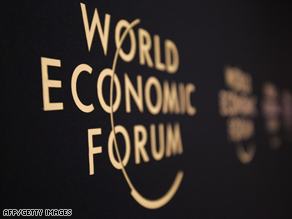 With the World Economic Forum taking place in Davos and the rival World Social Forum being hosted in Brazil, do you think there is a need for a middle ground to be found between these radically different groups? Can such a middle ground be found? What is the best way for society to deal with the looming demographic time bomb which will place great pressure on government finances? At this time of financial crisis, global conflict and climate change, what can be done to inspire the hope that sustainable living is possible and even positive? On a finite planet, is it not impossible for most of us to achieve fulfillment and happiness through material consumption, and will many of our children and grandchildren even have the opportunity to make that choice if we go on with our current ways of being? Is it not time to leave the very concept of 'economic growth' behind? Right now many countries have in essence guaranteed their major banks as "too big to fail." How will we move back to a system where such guarantees are not so absolute? What opportunities for solving climate change does the financial crisis present? The proper role of business in a democratic society is to serve the public (and future generations, through care for the environment and the state the world is passed down to them) and not to lead it. But business has often, in times of crisis, found itself in a natural alliance with authoritarian and populist states. So what can Davos do in these multiple crises (finance, energy, environment, poverty) to avoid comfortable alliances with authoritarianism and promote a democratic positioning of business and its role in wider society?